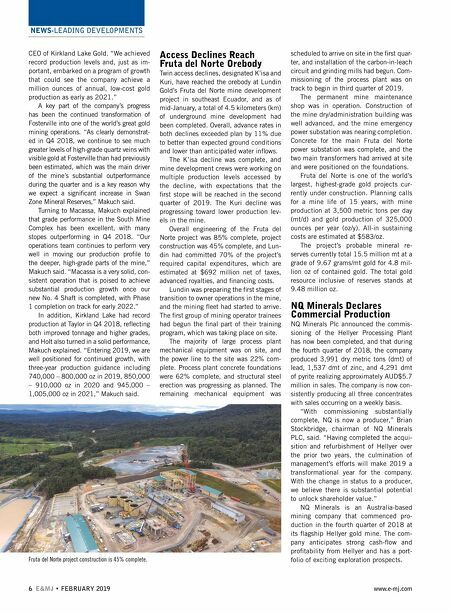 NEWS-LEADING DEVELOPMENTS 6 E&MJ • FEBRUARY 2019 www.e-mj.com CEO of Kirkland Lake Gold. "We achieved record production levels and, just as im- portant, embarked on a program of growth that could see the company achieve a million ounces of annual, low-cost gold production as early as 2021." A key part of the company's progress has been the continued transformation of Fosterville into one of the world's great gold mining operations. "As clearly demonstrat- ed in Q4 2018, we continue to see much greater levels of high-grade quartz veins with visible gold at Fosterville than had previously been estimated, which was the main driver of the mine's substantial outperformance during the quarter and is a key reason why we expect a significant increase in Swan Zone Mineral Reserves," Makuch said. Turning to Macassa, Makuch explained that grade performance in the South Mine Complex has been excellent, with many stopes outperforming in Q4 2018. "Our operations team continues to perform very well in moving our production profile to the deeper, high-grade parts of the mine," Makuch said. "Macassa is a very solid, con- sistent operation that is poised to achieve substantial production growth once our new No. 4 Shaft is completed, with Phase 1 completion on track for early 2022." In addition, Kirkland Lake had record production at Taylor in Q4 2018, reflecting both improved tonnage and higher grades, and Holt also turned in a solid performance, Makuch explained. "Entering 2019, we are well positioned for continued growth, with three-year production guidance including 740,000 – 800,000 oz in 2019, 850,000 – 910,000 oz in 2020 and 945,000 – 1,005,000 oz in 2021," Makuch said. Access Declines Reach Fruta del Norte Orebody Twin access declines, designated K'isa and Kuri, have reached the orebody at Lundin Gold's Fruta del Norte mine development project in southeast Ecuador, and as of mid-January, a total of 4.5 kilometers (km) of underground mine development had been completed. Overall, advance rates in both declines exceeded plan by 11% due to better than expected ground conditions and lower than anticipated water inflows. The K'isa decline was complete, and mine development crews were working on multiple production levels accessed by the decline, with expectations that the first stope will be reached in the second quarter of 2019. The Kuri decline was progressing toward lower production lev- els in the mine. Overall engineering of the Fruta del Norte project was 85% complete, project construction was 45% complete, and Lun- din had committed 70% of the project's required capital expenditures, which are estimated at $692 million net of taxes, advanced royalties, and financing costs. Lundin was preparing the first stages of transition to owner operations in the mine, and the mining fleet had started to arrive. The first group of mining operator trainees had begun the final part of their training program, which was taking place on site. The majority of large process plant mechanical equipment was on site, and the power line to the site was 22% com- plete. Process plant concrete foundations were 62% complete, and structural steel erection was progressing as planned. The remaining mechanical equipment was scheduled to arrive on site in the first quar- ter, and installation of the carbon-in-leach circuit and grinding mills had begun. Com- missioning of the process plant was on track to begin in third quarter of 2019. The permanent mine maintenance shop was in operation. Construction of the mine dry/administration building was well advanced, and the mine emergency power substation was nearing completion. Concrete for the main Fruta del Norte power substation was complete, and the two main transformers had arrived at site and were positioned on the foundations. Fruta del Norte is one of the world's largest, highest-grade gold projects cur- rently under construction. Planning calls for a mine life of 15 years, with mine production at 3,500 metric tons per day (mt/d) and gold production of 325,000 ounces per year (oz/y). All-in sustaining costs are estimated at $583/oz. The project's probable mineral re- serves currently total 15.5 million mt at a grade of 9.67 grams/mt gold for 4.8 mil- lion oz of contained gold. The total gold resource inclusive of reserves stands at 9.48 million oz. NQ Minerals Declares Commercial Production NQ Minerals Plc announced the commis- sioning of the Hellyer Processing Plant has now been completed, and that during the fourth quarter of 2018, the company produced 3,991 dry metric tons (dmt) of lead, 1,537 dmt of zinc, and 4,291 dmt of pyrite realizing approximately AUD$5.7 million in sales. The company is now con- sistently producing all three concentrates with sales occurring on a weekly basis. "With commissioning substantially complete, NQ is now a producer," Brian Stockbridge, chairman of NQ Minerals PLC, said. "Having completed the acqui- sition and refurbishment of Hellyer over the prior two years, the culmination of management's efforts will make 2019 a transformational year for the company. With the change in status to a producer, we believe there is substantial potential to unlock shareholder value." 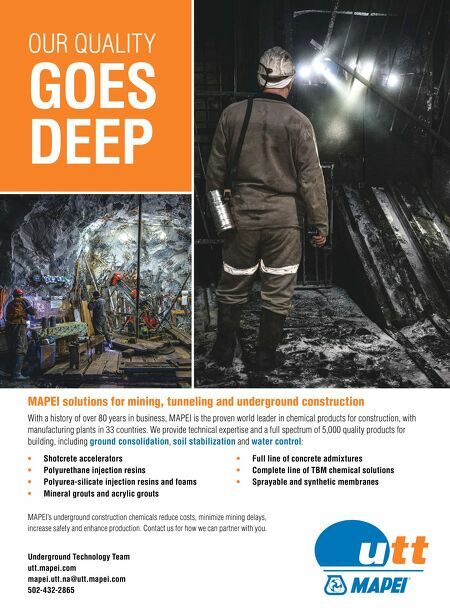 NQ Minerals is an Australia-based mining company that commenced pro- duction in the fourth quarter of 2018 at its flagship Hellyer gold mine. The com- pany anticipates strong cash-flow and profitability from Hellyer and has a port- folio of exciting exploration prospects. Fruta del Norte project construction is 45% complete.